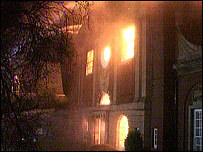 A fire which destroyed the library in Ramsgate is being treated as arson, Kent Police said on Sunday. 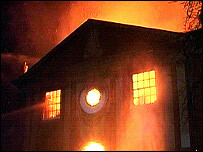 Another blaze at the register office just before 1000 BST on Sunday is also being treated as suspicious. Police say it may be linked to the library fire. Thousands of books, several paintings and historic artefacts were lost in the blaze at the Victorian library building which started late on Friday. Residents say they are determined that the library will be rebuilt. Over 100 firefighters fought the blaze as 16 fire engines were called to the library in Guildford Lawn, Ramsgate, just after 2130 BST on Friday. Fire crews stopped the fire spreading to nearby Clarendon House School. Senior Divisional Officer Neal Fowler said: "Because it was a library, there was a lot of flammable material inside, and because the structure was Victorian, there was plenty of wood, which meant the roof void became involved at an early stage." Ramsgate resident Bob Pryor told BBC Radio Kent: "We want our library back. "It's 100 years old this year, in October. "It is part of our heritage and it is part of our history. "We have spent half our lives in there." Library campaigners have been selling pictures of the burning building to raise money to rebuild the town's library.